I knew they were going to do it and had been there to see, but it hadn’t opened. Well, one of my pics is now on permanent show at the WWT Martinmere, in their lovely new Mere Side Cafe. You can’t miss it [the bird pic, not the cafe] – it’s the giant Wigeon on the left hand wall as you go in. Of course I was happy to donate this image to the WWT, they are a great organisation. Martinmere is a cool place to visit, as you can get your fill of wild birds on the mere and the many hides; from the captive collection – great for examining those rare birds at close range; and then get your fill of food and snacks back at the cafe. We went there over the last couple of days – the weather was atrocious but the Banana Cake was delish! 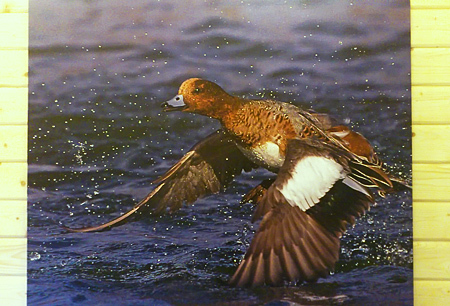 The Wigeon in take-off, was actually taken at WWT Caerlaverock, in Dumfriesshire, Scotland, from the Folly Pond Hide. Caerlaverock is another great place to visit if you get the chance. The Svalbard Barnacle Geese flocks are astonishing. If you’re looking for somewhere close to stay to Caerlaverock, you could try Jamie Cowan’s Nethertown Cottage – a mere half-mile from the reserve, with thousands of geese in the field next to the cottage – a great place to stay. The image is on canvas and is approx. 1.2 metres x 1.2 metres in size – shown here attached to the timber wall of the cafe.